You don't think they just run basic cable into all the guest rooms, do you? This rack contained tuners, modulators, passive head-end combiners, and a distribution amplifier, which provided analog CATV service throughout the hotel. The tuners each connected to the satellite on the roof. There was one tuner for each station. 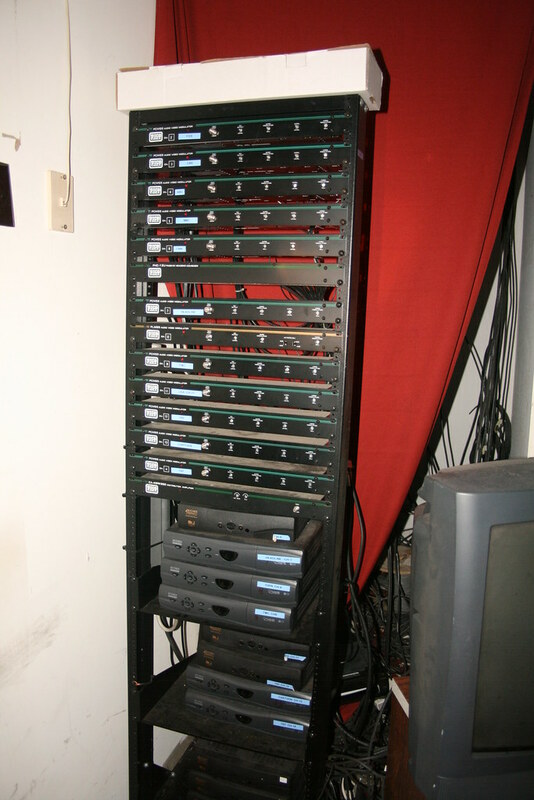 These tuners fed to modulators, which put the tuned channel into its internal channel assignment (e.g., mapping satellite channel 702, to channel 2 internally). Each modulator outputs only one video feed, so a passive head-end combiner is used to combine the independent signals into a mixed (tunable) stream. The final head-end combiner passed the complete signal to the distribution network which ultimately connected directly to the guest room TVs (or other amplifiers along the way).